By the inspiration of Radhanath Swami, Rath Yatras are conducted every year in various parts of Mumbai. 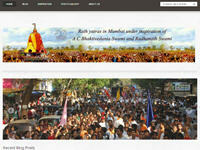 This site presents many articles related to Jagannath Rath Yatra and also the photos of recent Rath Yatras. Category Ratha Yatra, Sannyasis June 18, 2012 by ISKCON Desire Tree.